No Se Mancha’s Brazil election specialist João Schlüter concludes his election coverage by analyzing the narrow victory of Dilma Rousseff over Aécio Neves. The people have spoken, by a very narrow 3 percentage point margin, Brazilians decided to double down on Dilma Rousseff, giving her a second term and a fourth consecutive term to the PT. 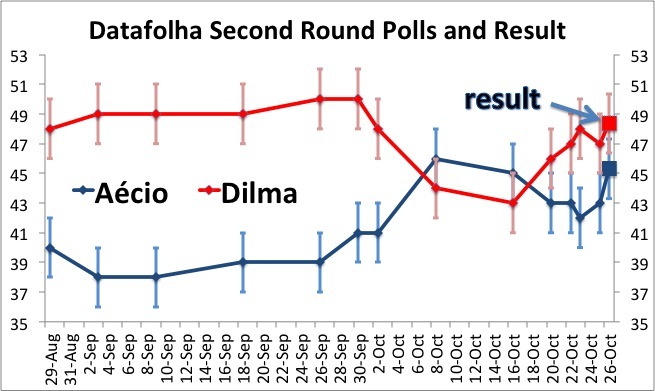 The last Datafolha poll was published just a day ahead of the election, after the Veja-Petrobras affair had broken. 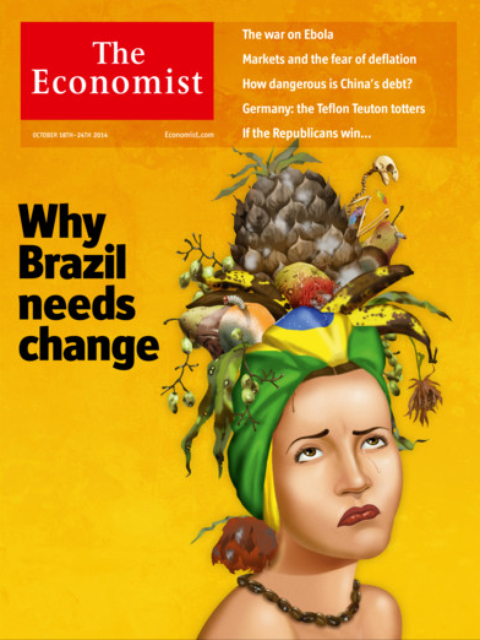 It should Dilma Rousseff at 47 percent to Aécio Neves at 43 percent. The actual outcome as percentage of total vote was 48.4 to 45.3, both a bit higher but with the 3 percentage point margin spot on. 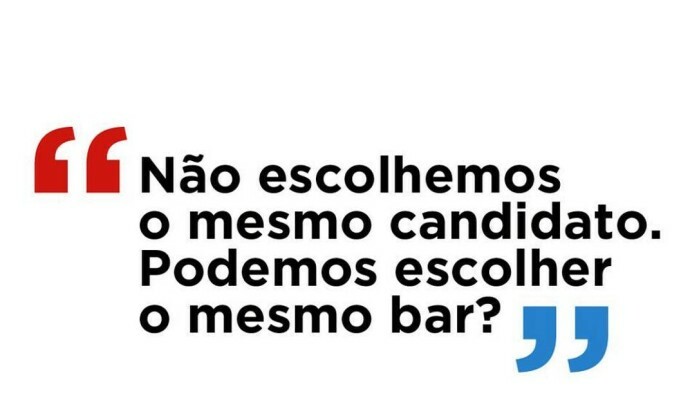 Mansueto Almeida, an advisor to Aécio Neves (and en economics blogger I very much respect) questioned the make-up of the electorate in the polls and tried to “un-skew” what he saw as a skewed sample (over representation of poor voters). For those who closely followed the 2012 US Presidential election, this might sound familiar. Back then, many Republican commentators argued that the polls were skewed, assuming too high a turnout of democratic leaning demographics (young people, African Americans etc). They were wrong then and the un-skewers were wrong this time too. The problem in my view: While a high-quality pollster aims at getting the most realistic result, the un-skewer tends to have a clear preference. Un-skewing is too close to wishful thinking. As was mentioned here before, Brazilian elections tend to be decided in Minas Gerais – earning it the title “Ohio of Brazil”. The Minas theorem was confirmed: Aécio Neves didn’t win his home state and hence was defeated nationwide. The result in Minas was actually the same as the national result: 51.6 percent to 48.4 percent of the valid vote. 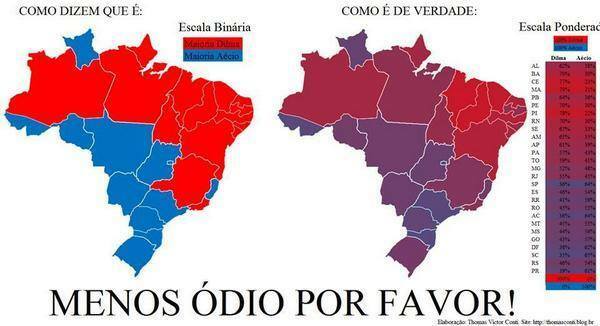 Aécio also did not capitalize on the opening left by the Marina Silva vote in the Northeast, especially Pernambuco. In the state Marina Silva had one with 48 percent in the first round, Aécio remained below 30 percent, leaving Dilma with a win in line with her overall strong showing in the Northeast, where the PT candidate won over two-thirds of the vote. Yes, Dilma did win all Northeastern states and the majority in the North, while Aécio won the South, Center-West and most of the Southeast. However, Dilma also won crucial victories in large Southeastern States (Minas Gerais and Rio de Janeiro) without which she could not have prevailed. Aécio managed two win three fairly poor states in the greater Amazon. Looking at the result in a less binary fashion (after all this is not the US winner takes all system), Brazil is actually not divided in red and blue states, but rather 28 shades of purple. Fun-fact: Aécio had his single best result at the Brazilian consulate in Miami, winning over 90 percent of the vote there. Slicing the electorate by other characteristics, especially socioeconomic status, the tendency is clear: Dilma wins the lower classes by a significant margin and the middle narrowly, while Aécio dominates the richest third or so. However, even there the divide is less clear cut then it might seem: There are plenty of well-educated upper-middle class folks who voted for Dilma (I personally know quite a number). The salient feature of this campaign in the end was really how it seemed to divide the country. Anyone who has spent time with Brazilians knows that we tend to be a friendly, peaceful and joyful people who mostly avoid direct confrontation. However during this campaign the tone got very rough and disrespectful on both sides. PT supports would call Aécio a playboys and wife-beater and his supporters snobs and heartless oligarchs, while Aécio supports would call Dilma a criminal, communist and her supporters ignorant, lazy and various racial slurs not worth repeating here. Clearly the country didn’t use to be this way. When Lula (a poorly educated Northeasterner) left the presidency in 2010 his approval rate was over 80 percent. The combination of a more difficult economic situation, a very tight election, some overreach by the government in attacking the opposition and the increased use of social media as an echo chamber has led to a complete change in political culture. There is plenty of evidence that the strong embrace of social media by Brazilians and the way people communicate there compared to real life has lead to a deterioration of civility in the political discourse. Luckily, now that the election is over, Brazilians are remembering their sense of humor and value of putting friendship and harmony first. Combine this with their love of social media and they even created a Facebook page dedicated to making up with the friends you lost during the campaign. My guess is that Brazilians will mostly go back to their friendly ways, but the political scene will remain polarized for a long time. The opposition, though defeated leaves this election stronger than it entered it. The economic situation remains delicate and the unfolding Petrobras corruption scandal will keep politicians and observers on their toes for many more months. This concludes my coverage of the Brazilian presidential election. I hope you enjoyed it and maybe No Se Mancha will have me back some time to comment on Brazilian politics. This entry was posted in Brazil and tagged Aécio Neves, Brazil 2014 elections, Dilma Rouseff. Bookmark the permalink.